That whole conflicting with my desires thought from my last post should have prepared me. But it didn’t. I ran off in my merry little sanguine way expecting sunshine and roses. 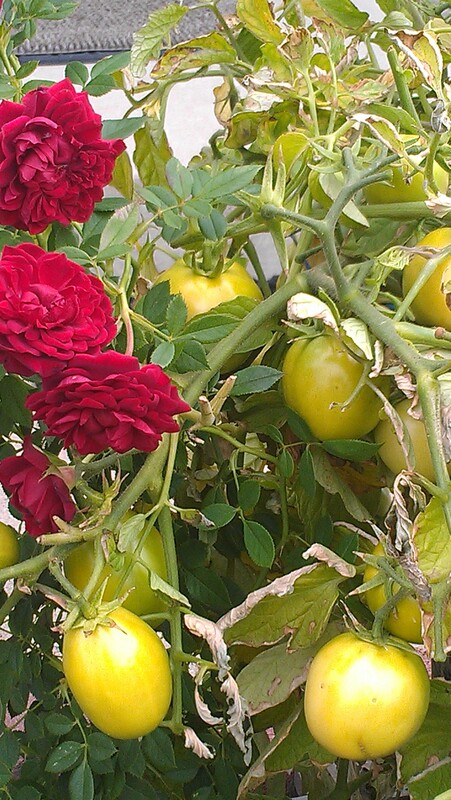 Only what grew along with the roses were tomatoes. I started figuring out that things weren’t as easy as I expected when I went to one of my favorite places: A writer’s conference where I was reminded that my new epiphany was really a curve ball. See, ever since 3rd grade when I wrote a story about a pencil and an eraser, I wanted to be an author. (Oh brother. The tears still spring to my eyes, and honestly I’m tired of crying about this.) Somewhere during high school speech competition I realized I also wanted to be a speaker. For the last 25 years I’ve lived my other childhood dreams–to be a teacher and a mommy, and as the years have ticked away toward cheering on my last high school graduate, I’ve eagerly awaited greater freedom for that dream of becoming an author and a speaker. Sure, I am those things already. I have two published fiction books, have published over 300 non-fiction pieces, and have spoken for homeschool groups, writer’s groups, and mom’s groups, as well as having taught at writer’s conferences. But that was all in my spare time. Now I was ready to enter full-time into the world of writing and speaking–to take the whole gig to another level. To write the deeper, more complex stories of my heart. To up my speaking opportunities. I’d waited for so long for this moment. Then God gives me this curve ball and tells me to learn to be a business woman. I need to mention here that up until this point everything I’ve done in life was connected to a dream. Teacher. Mommy. Writer. Speaker. Never once did I dream of becoming a business woman. I spent a lot of the writer’s conference in tears. Not because it wasn’t fun. It was actually amazingly wonderful. Except for the increasing understanding that my next season wasn’t going to be all about my dreams and except for the fact that the keynote speaker said we had to be obedient when God sent us curve balls on our writing journey. By the time I left I’d convinced myself that God wasn’t going to let me write books for a while. And I was heart-broken. Thankfully, He then gave me Epiphany #4. I did get to write books. Just not the deeper books of my heart–yet. He wanted me to do what my agent, Rachelle Gardner, had suggested right before that second car accident that left me unable to write books for a year. He wanted me to write genre romance. The good news is I like romance–both in books and in real life. And evidently I’m pretty good at it because I’ve helped a non-romantic male learn to be at least a little romantic, and my first romance story was a finalist for a prestigious Christian fiction award. More good news is that genre romance is the kind of thing I can usually write while living with a lot of chaos in my life. It also is light-hearted enough to keep me happy and sane when I write it (unlike women’s fiction, which can bring me into the doldrums as I dig deep). My agent put me on a deadline to have that next book to her, and I added up word counts. I need to write 1700 words/day, six days a week. The good news is so far I’ve written 5,175 of the 55,000 words I plan to complete by Thanksgiving. The bad news is I haven’t written any today because I’ve been too busy writing blog posts. And so I’m learning how to swing at this latest curve. Letting go of how I thought this next season would look and embracing a new plan. Most of the time I’m good with it, but then there are those days . . . and I’ll tell you about one of them tomorrow. Wow that’s awesome!! God never tells us much in advance and I’m always glad . Thank you , Sheila! It’s been quite the journey!